Cast with a boat load of VeggieTales stars, The Pirates Who Don't Do Anything is a comedic adventure filled with family-friendly lessons on the importance of doing what is right - even when it's difficult - and discovering that real heroes don't have to be tall, strong, handsome. . . or even human. A boatload of beloved VeggieTales pals embark on a fun and fresh pirate adventure with their trademark humor and silly songs in The Pirates Who Don't Do Anything - A VeggieTales Movie! Larry the Cucumber, Mr. Lunt and Pa Grape find themselves on the ride of their lives when they are mysteriously whisked back to the time when pirates ruled the high seas. As they help a brave princess rescue her brother from a dastardly pirate villain, they battle evil cheese curls, giant rock monsters and their own fears and become the most unlikely heroes you've ever seen. It's a swashbuckling good time for the whole family! "Becoming a Real-Life Hero" (Video Feature): Takes a look at what it takes to become a hero in public service roles. It's a fun, behind the scenes look at firehouses, police station, etc guided by Larry the Cucumber (Elliot as videographer) and kid friends. "Going to Sea" (Video Feature): Takes you on a visit to a marina and an exploration of life on the water. Guided by Mr. Lunt (Sedgewick as videographer) who is looking for pirates, you'll enjoy the ensuing comedy as he talks with yacht owners, fishing boats and others. A Parent's Guide Interactive Book: Gives a discussion guide and tools for character building reflecting the values of the movie characters. "Making A Veggie Pirate Movies" (Video Feature): Interviews with the production staff about the creation of the film, as well as location shots of the animation studio during production. "Why We Do It" (Video Feature): Interviews with production staff speaking on the reasons for making the story, and discussion of lessons within the story. Art Gallery: An interactive feature that shows concept images from the film along with commentary by the design staff. Studio Commentary: Feature-length audio track with the production staff from the film. "Character Commentary" (Video Feature): Edited 5- to 7-minute piece of highlighted scenes with audio commentary from various characters from the film. "How to Draw" (Video Feature): Features concept artists with kids following along as they draw various characters from the film. Pirate Sing-Along: Sing-Along versions of the songs from the film including the songs "Rock Monster" and "Yo, Ho Hero"
Pirate 101 with Willory and Elliot: Learn to act and talk like a pirate! Bonus Clips: Animated clips of the characters shown as a payoff for playing games feature alternate endings or outtakes from the film. 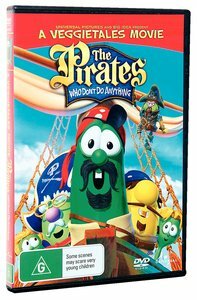 About "Veggie Tales: Pirates Who Don't Do Anything Movie"
Customer Reviews For "Veggie Tales: Pirates Who Don't Do Anything Movie"
This a regular, popular request by the children! Great story line, music and characters that encourage engagement with biblical values at a young age. Absolutely brilliant DVD by the veggie tale crew. A wonderful movie length adventure that the whole family will enjoy. This is a VERY popular movie with all the children that I know. My 7 year old has loved the rock monster sof for at least 3 years!! Although the movie has all the hallmark touches that we love from veggie tales   I understand the movie was deliberately made without "God" references so that this DVD can slip into "mainstream" viewing and impact those who have not yet been saved. A great gift for families who are not yet saved.